Kenya's Supreme Court has blamed the country's electoral commission (IEBC) for its decision to annul the re-election of President Uhuru Kenyatta. The judges said the 8 August poll was "neither transparent or verifiable". Deputy Chief Justice Philomena Mwilu said the IEBC did not verify the presidential results before they were announced. Mr Kenyatta got 54% of the vote against opposition leader Raila Odinga's 44%, according to the IEBC's results. Mr Odinga went to court alleging that he had been cheated of victory and that the IEBC had not followed the law in the conduct of the election. The Supreme Court took the unprecedented step of annulling the election on 1 September but it has only now explained why it took that decision. 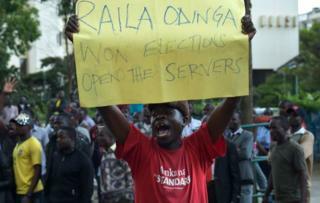 It was the first time in Africa that a court had agreed with an opposition demand to cancel a presidential election over rigging allegations. 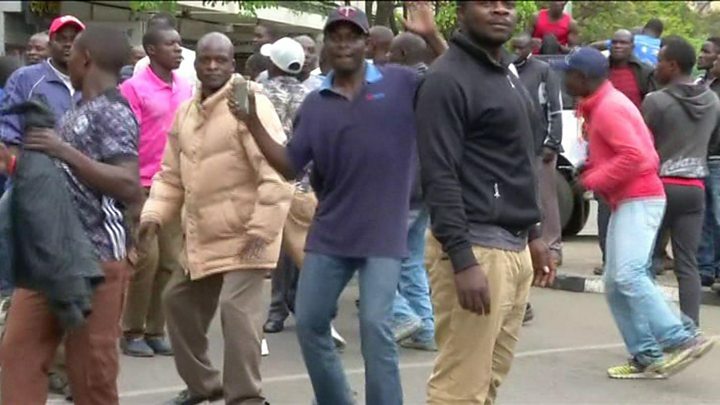 While the judgement was being read out, police fired tear gas outside the Supreme Court to disperse opposition supporters who had gathered to support Mr Odinga. At one point a swarm of bees attacked some of them. Ms Mwilu said that the commission had not complied with a court order to allow its electronic voting system to be scrutinised. She said that the IEBC's refusal to comply with the order to grant access to its electronic voting system led the court to "accept claims by the opposition that the computer system had been infiltrated and compromised and the data interfered with, or that the IEBC officials interfered with the system themselves". The electoral commission has disputed that its system was tampered with. Opposition coalition Nasa has been pushing for the sacking of IEBC officials whom it blames for bungling the polls, saying that a new team should be in charge of the re-run scheduled for 17 October. Doubts have however been cast on this date because OT-Morpho, the French company that provided the voting kits, has said that it needs to reconfigure the more than 40,000 kits and that the process would not be complete until at least the end of October. The judges had ordered the re-run to be held in 60 days. Four judges voted to annul the election while two dissented. Another judge was taken ill during the hearing of the petition and did not take part in the case. The Chief Justice said that the irregularities would be found unconstitutional by any court "with its right mind"
When making the earth-shaking judgment annulling the presidential election, Chief Justice David Maraga had said that the judges had found "irregularities and illegalities" in the conduct of the election. This detailed and much awaited ruling was about giving meat to these weighty allegations, and he along with his colleagues, did just that. They accused the IEBC of failing to follow the law and being duplicitous in its conduct, an indictment to an institution that is suffering from a crisis of public confidence. The court has essentially given the opposition lots of extra ammunition for its push to get IEBC officials sacked and push for changes in the voting systems ahead of the re-run. The judges have also effectively called out the company that printed the ballot papers, by agreeing with the opposition that some did not have the required security features. Nasa wants the IEBC to find another firm to print the ballot papers for the re-run. This means that IEBC head Wafula Chebukati is coming under huge pressure to change his team and prepare for a new election, which is increasingly looking like an impossible task. This state of affairs is likely to add to the growing tension and uncertainty that has gripped the country since before last month's election.